This lamp was on loan from Charles Tsai / Intelligent design cycles, thanks! Mass: Lamp head 127g with ca. 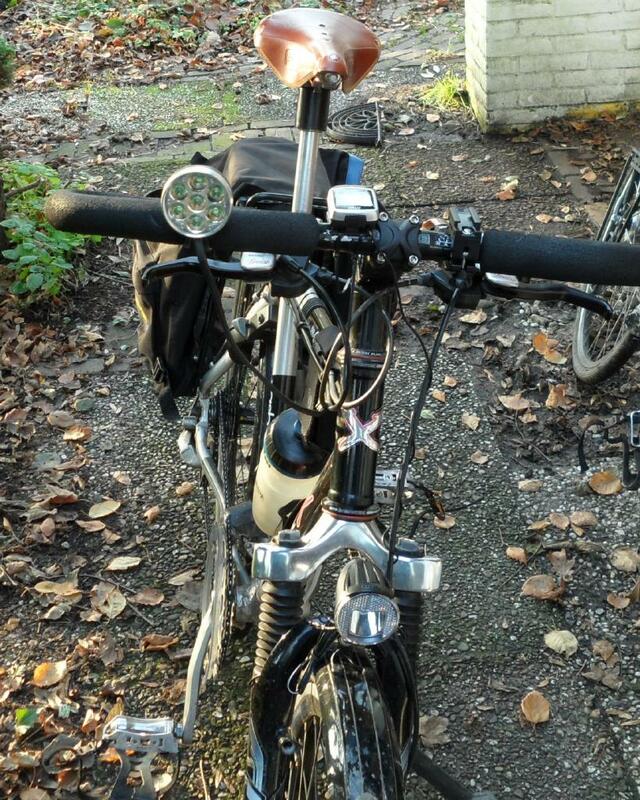 35 cm cable, battery 334 g.
Size: Lamp head ∅ 54 mm, length 43 mm, and 53 mm with the bit of the mount that sticks out. First impression of the lamp, charger etc. : Everything here exudes quality, it's almost incomparable to a Magicshine lamp. The charger, 'Charger one', for example has an aluminium casing with blue backlit LCD (text in white) showing what's being done. 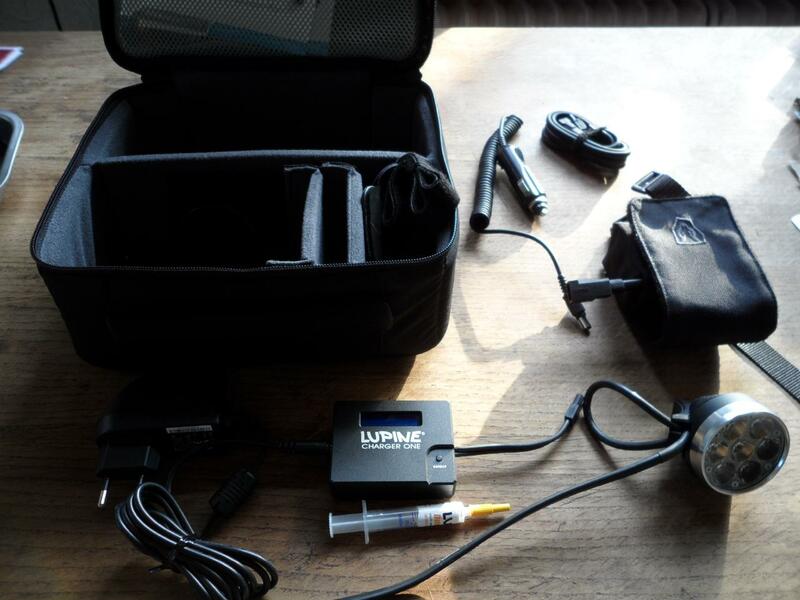 The cables of the battery are very flexible, and noted on them is that they are ok up to -40 ° C. The box contains manuals in colour clearly showing how the lamp and charger work. Then there's a little syringe with lubricant to put on the connectors for rides in the wet, to keep them from corroding. On the syringe is printed "Dutch grease". Is that because of the almost always poor weather here? Apt I suppose, although calling it English grease would perhaps be even better ;-) For the price, which is about 8 times that of the Magicshine MJ-808 (but with a claimed light output of ca. 1850 lumen which seems real considering it has 7x XP-G LEDs, so a little more than 3 x what the Magicshine MJ-808 produces), expecting this kind of quality is perhaps logical. I have to say, presentation and quality leave very little to be desired. Well, perhaps a quickstart leaflet if you don't want to walk through the manuals but immediately want to try it out? Note that I review this lamp not for how well it's suited for its actual purpose, i.e. 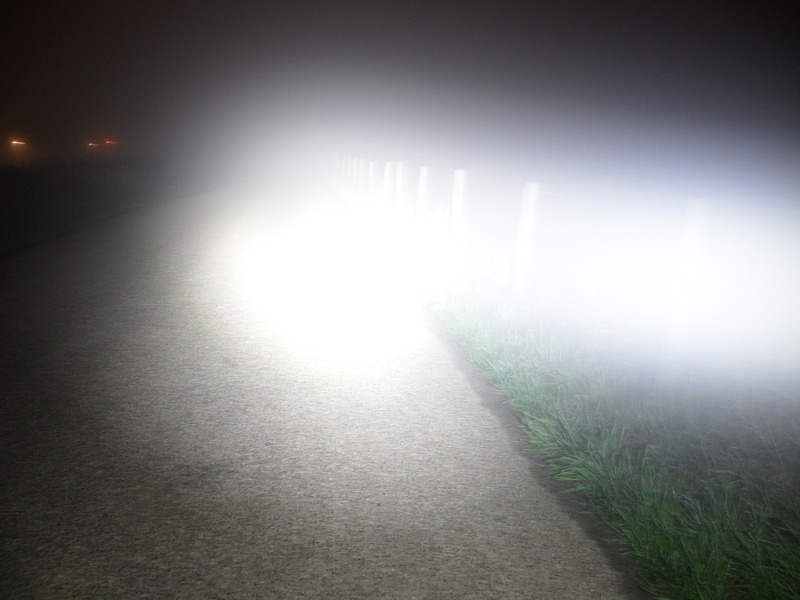 nighttime mountain biking (although I do have a comment about the optimal beam shape for MTB use at the end of this review) but to see what one experiences with this much light, and to see how well it lights up a regular road compared to a Philips LBL. The amount of light that gets in your face is enormous, and definitely not pleasant, but I could still see the sides of the road or bushes beside it. Upon reflection I think the reason for this is that the Magicshine has a not all that strong general illumination coupled with a fairly strong hotspot (that was shining in my face when I did the test, as I aimed the Magicshine fairly far). 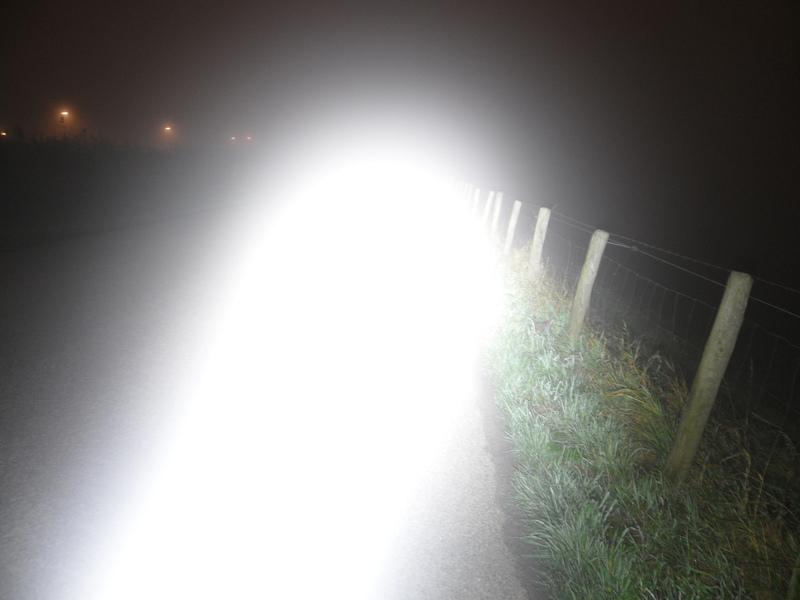 This means the road and sides of the road with the Magicshine are not that well illuminated, at least not enough so that you can see them from the reflected light off of the light coming from that beam despite the direct light from the light beam getting into your eyes. 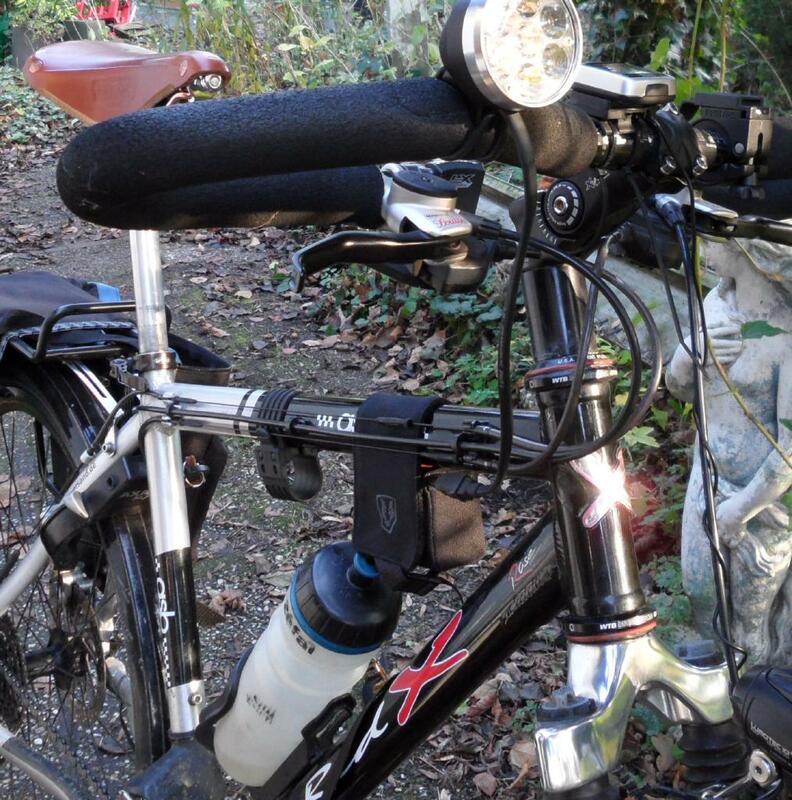 Note that in both cases my own headlamp, Cyo in the test with the Betty, and Edelux in the test of the Magicshine, were useless to see anything. In the case of the Magicshine this meant I saw nothing, in the case of the Betty could however see enough of the road/surroundings. Why is this? Well, with the Betty it's different as it has a much more homogeneous beam that puts out so much light to the sides of the road and onto the road itself, on all points of the road, that I could still see the road or bushes on the side of the road, just from the light of the Betty's beam that gets scattered from those objects. Beamshots on road 1: Camera height: ca. 1.65 m, camera aim: ca. horizontal. 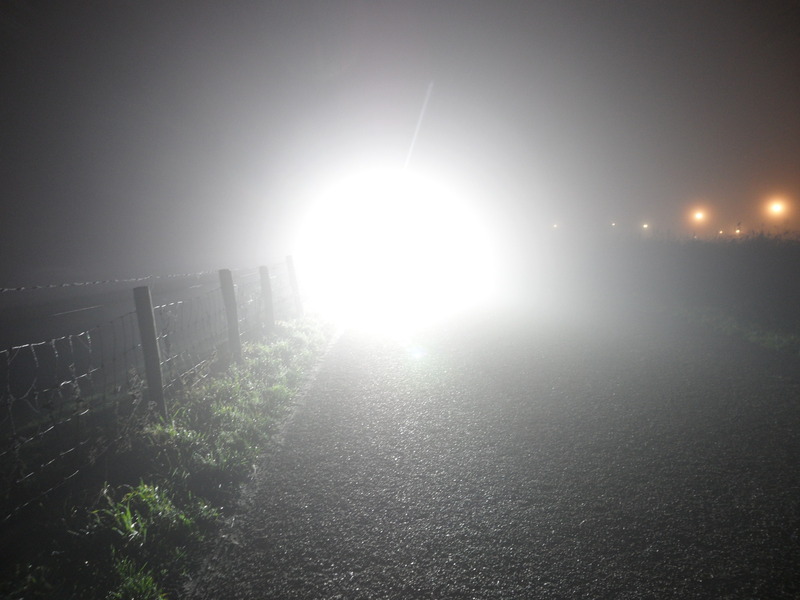 For background information on making beamshots see: Camera settings, lamp settings and roads used to make the beamshots. Beamshots on road 2: Camera height: ca. 1.65 m, camera aim: 2nd marker at 50 m, position: 0.40m behind the lamp. What is noticeable is that there's very little change in illumination at long distance pointing the lamp close or farther away on the ground. This is the same effect I saw with the Magicshine MJ-808 and the Ktronik triple XP-G. Also, when aiming the lamp close, it looks very impressive in the beamshot, very bright, but you should know the eye adapts to the light, so actually the near-field is now too bright so you don't see as well further ahead. All in all my side by side comparisons really confirm what I've said on my lighting pages, namely that a lamp with a good beam with cutoff, i.e. with fairly even illumination of the road surface and not much above the horizon, delivers much more usable light for the same power. Beamshots on road 1: Camera height: ca. 1.65 m, camera aim: ca. 50 m, position: ca. 2 metre behind the lamp/bike. It was freezing (ca. -4°C), fairly strong wind, moisture from the previous rainy days was frozen on the gras and some parts of the road surface. Beamshots on road 3: Camera height: ca. 1.65 m, camera aim: 2nd marker at 50m, position: 0.40m behind the lamp. There are some small white sticks (not retro-reflecting) on the ground at 10 m and 15 m distance on the left and right hand side of the road. In all cases the amount of light oncoming traffic gets in their face is huge although with the very closely aimed Betty it's not all that bad. However, only with the Betty aimed far will you get a lighting of the road that's better than a Philips LBL, and with the Betty aimed very close, which is the only setting I found acceptable for oncoming traffic, the Betty is simply rendered nearly useless and no better than a standard dynamo lamp because the near field (close to your front wheel) is illuminated far too brightly and your eyes will adjust to that. Huge amount of light, and I'm not rating it as a bike lamp for on-road riding, because that's obviously not what it's for. What is clear from my experiences (and this comes across less well in the pictures due to the fact that the eye adapts to the brightest light source, which is also the reason why strong oncoming lights result in not being able to see the road, such as happened in my tests with the Magicshine), is that the Betty (2011 version) at a claimed 1850 lumen, which it undoubtedly can produce with 7 x XPG-R5, i.e. 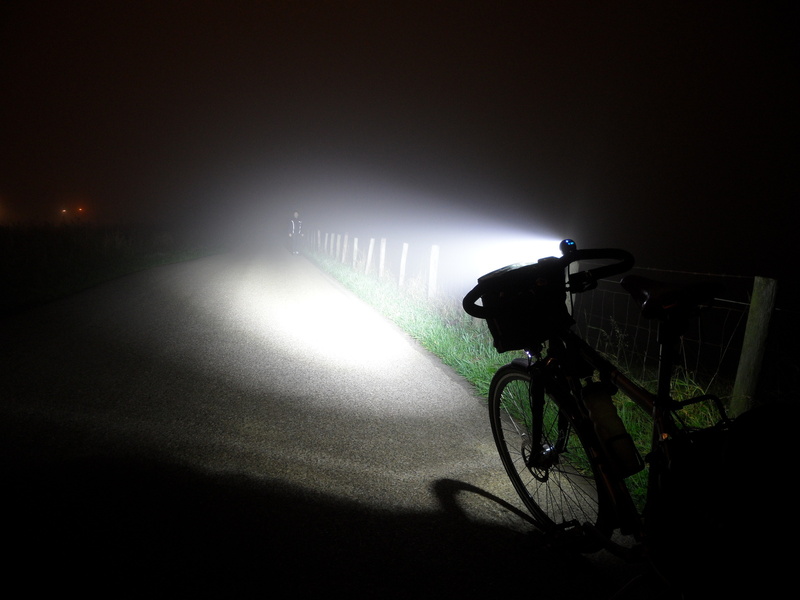 7 x more light than the Philips LED bike light, is only slightly better at lighting up the road than the Philips LBL. 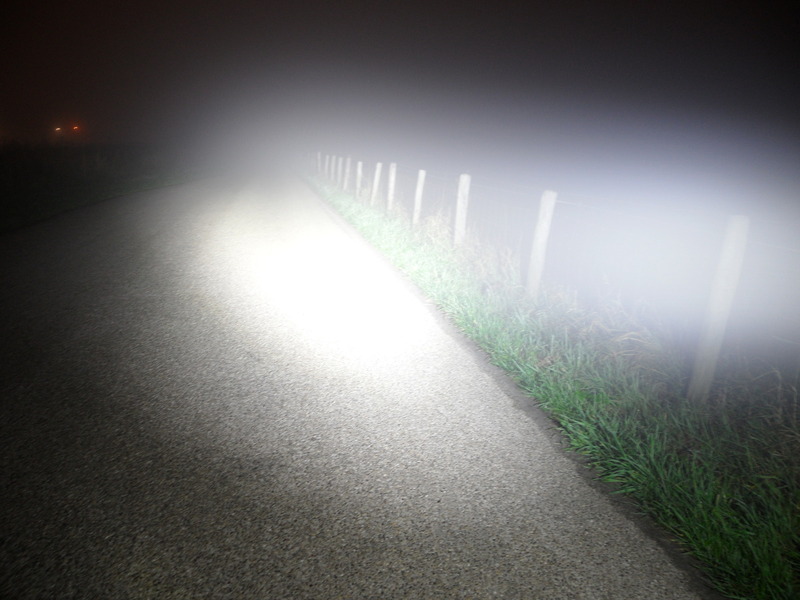 I would further say that from comparing the Betty with the Philips LBL, it is fairly clear that having a wide, even illumination of the road surface is very important, even more so when mountain biking so you can choose your trail. This also means a lamp for MTB use could be made a lot better if it didn't have a symmetric beam, but a beam such as the Philips LBL, but even wider and with more light added that goes above the horizon. If you take the light from the Betty, unless you're riding in a dense forest, the light going straight up is just going up into space, and that light could have been used better further on the road/trail, or to the sides.